I got this recipe from Better Homes & Gardens, my most favorite cookbook that I got for my high school graduation as a gift. This is one of the most versatile recipes that I have ever used. If you have ever used Rhodes roll dough, this is it! For me, this is sooooo much better; I don't have to wait to thaw it out. Everyone loves a hot, soft, buttery dinner roll. This recipe is so versatile and can be used for any recipe that calls for store bought frozen bread dough. You can choose to use butter, margarine or shortening - butter in this recipe gives the rolls flavor, while shortening creates a light, fluffy texture to the rolls. Putting your cold eggs into a bowl of hot tap water for a few minutes will help bring them to room temperature. 1. Put 2 cups of flour in a mixing bowl or bowl of stand mixer.2. Add the yeast, vital wheat gluten (if using) and salt.3. In a microwave safe bowl, combine milk, sugar, butter, and melt on 50% power in microwave for 3 minutes or until butter is almost melted. Stir until sugar is dissolved.4. Drain water from eggs. Crack eggs and add eggs to the milk mixture.5. Pour egg mixture into the flour mixture and mix well. All this mixture to sit or "sponge" for 10 minutes.6. Using a dough hook with the stand mixer, add rest of flour, one cup at a time until dough clings to hook and almost cleans the sides.7. Touch the dough lightly. Add more flour if dough sticks to your fingers and knead for 3-4 minutes. Dough should be soft, smooth, elastic, wet, and not sticky. 8. Scrape down sides of the bowl, lightly oil the top of your dough, and cover it with plastic wrap. 9. Allow dough to rise to double in size in a warm, draft free place (in oven with a pan of hot water underneath) for 30 minutes. 10.Divide dough into 2 equal balls. Cover with plastic wrap and allow dough to rest for 5 minutes. Shape as desired, into 24 rolls total, and place on lightly greased baking sheet or silicone baking mat. Cover with plastic wrap, allow to rise for 20-30 minutes. Divide dough into 12 pieces. cover and let rest for 10 minutes. For hamburger buns, shape each portion into a circle, tucking edges under. Place on a lightly greased baking sheet or silicone mat. Using your fingers, slightly flatten circle to a 4" diameter. Cover shaped rolls (no rising) loosely with plastic wrap, leaving room for rolls to rise. Chill for 2-24 hours. Uncover, let stand at room temperature for 30 minutes. Bake as directed. Shape rolls, and place on baking sheet, cover with plastic wrap and freeze for 6 hours. Remove from baking sheets and put into freezer safe bags. Freeze for no more than 3 months. After shaped rolls have risen, bake in a 240°F oven for 20 minutes. Cool on the pan for 20 minutes. Keep rolls in a plastic bag in a refrigerator for up to 1 week. Bake rolls in a 400°F oven for 8-10 minutes. can this be made without the wheat gluten? Yes! Definitely...I just use wheat gluten to make a softer, lighter, roll with a higher yield. I believe it also helps me handle the dough better. Click on the vital wheat gluten link in the recipe for more information. This recipe will make 24 dinner rolls or 12 hamburger buns. Check the Shaping post for ideas. What is the purpose of putting the eggs in the glass of hot water? Does it cook or firm up the egg at all? Yes, I checked there already in anticipation :) Thanks so much. Hi Susan~ the egg tip is to bring the cold eggs to room temperature. It doesn't cook up the egg at all. These rolls were awesome! They were quick, simple and fun to make with my daughter! It was shocking how soft and tender they were! Thanks so much! We all loved them with Thanksgiving dinner! Gina, I am so happy that you and your family enjoyed this roll recipe ~ thanks for such a great compliment! Saw these on Mags blog and had to make them. They were delicious. Rosemary, thanks for hopping over to my blog. Mags did a beautiful job on her rolls, didn't she? I'm glad yours turned out so well! I found this roll recipe in my BH+G cookbook 15+yrs ago and I agree they are the best dinner roll...I usually make clover leaf rolls with mine just because it is quick. I have never tried the vital wheat Gluten and bought a box a week ago. I made the mistake of using it in a recipe I hadn't tried before (king's hawaiian bread) and not sure it made a difference. I will make sure to use it in my dinner rolls today-I should be able to see the difference having made these several times over the past several years. Uummm ~ You will have to let me know if you notice a difference...I usually recommend it for beginner bakers as it helps the handling of the dough. If you use too much VWG, you will get a chewier bread; (think of bagels)You are also supposed to get a greater yeild (larger roll)with VWG and I only use 1 T. in this recipe. Good luck! These are the first yeast rolls I have ever made. Absolutely fantastic!! This recipe was exactly what I was looking for and very detailed. I did a test run today with fantastic results and plan to cook them for Christmas dinner too. Thank you! I made these dinner rolls last week and they were DIVINE!!!!! I tried both, the Make Ahead and Brown N Serve, versions. Will post about them soon - still have to clear my BBA backlog. ap269, I'm SO glad you enjoyed them! I made the rolls tonight, and they're not as fluffy. Am I doing something wrong? When you say mix the flour and yeast, do i mix it in my stand mixer with a paddle attachment? or with a whisk? New to cooking. My post about your dinner rolls is up ;-). I made these rolls again (make ahead version), this time for my son's daycare's carneval breakfast. They were a big hit!!!! Thank you Frieda for teaching me how to make this last night! I had a great time at the class last night and will definitely be trying this on my own soon! Mallary ~ You are so welcome! It was so fun to meet you! I'm glad you had a great time ~ let me know how the rolls turn out for you. The recipe worked well...unless you have to make it ahead of time. The dough falls in the fridge. The overall taste is quite poor as well. Very yeasty. I do not recommend it. If the dough is left in the fridge for MORE than 24 hours, it CAN collapse (over rise) and develop a yeasty, sourdough-like flavor that is not a good combination for a sweet dough. I wanted to let you know that I made these for Thanksgiving this year and they were fantastic! I did the brown and serve method, even though it was an all-in-one-day thing. I wanted to make sure they were fresh from the oven, and mine was going to be busy with other things. So I made them a bit earlier they took them to my mom's for the final bake. Perfection. Thank you for such a great recipe and technique. It was convenient and easy-awesome combo! Stephanie, you can sub soy milk for the milk in this recipe. Keep in mind that it may change the texture of the bread. I use skim milk, which works fine, but the outcome is not as rich as if I had used whole milk. Is your boyfriend allergic to butter? Butter is in this recipe as well. Frieda, do you think if I use high-gluten bread flour, I could omit using the gluten? Should I adjust the amount of flour at all if I try this route? I love Rhodes Rolls. Being able to make them from scratch would make my husband very, very happy indeed! Captain Michah ~ Yes, you absolutely can use a high gluten or even regular bread flour. No adjustments necessary, as there is only 1 T. of VWG in this recipe. Good luck! Wow! Gonna have to try these too. Hi Frieda, I'm definitely going to try this recipe but not this Thanksgiving as I already have my dough waiting in the fridge, but I do have another question since you are all about breads. This is a long shot question but I've been trying to find a recipe for a German bread roll (I lived in a small town, Heilbronn, GE). One of their bakeries made a roll that was white & had a sweet flavor that was so light in texture it practically melted in your mouth, it looks similar to the a recipe you have for Sweet Potato Buns; the shape anyway...This may be a challenge but I had to ask..
Hi Toni! This roll recipe is soft and light, but the texture (crumb) is more substantial than potato rolls. My husband likes these rolls because you can "mop gravy with it..." Potatoes do give breads a lighter texture. This recipe is next on my bread baking list after the holidays! Dear Frieda: I treated myself to a KitchenAid Professional 600 series mixer and started baking bread for the first time in my life. I have only been to your website and made your dinner rolls twice. I've made them for my family, my friends and my boyfriend's family. Everybody loves them! Thanks for sharing your passion with others by educating newcomers like me. great big thanks to you and my Auntie M (Mags at othersideoffifty.com) for this recipe! it is exactly what I was looking for. I was able to make the kind of rolls I wanted. yes!!!! Love MAGS and her recipes! Glad you all are loving these rolls, too! So excited! I love making homemade bread and found your site for the heart shaping technique. I am making your recipe and shaping them into hearts for buffalo chicken sandwiches for Valentine's day. I am going to tell family they are the red hot love sandwiches <3. Thought it would be a cute idea and one even the teens will think is cool. I will let you know how they go over. What does it mean to let the mixture sponge for 10 minutes? It means to let the mixture sit, allowing the flour to absorb, or "sponge" the liquid. Whenever I make rolls they are usually a little more dense than I like. I made your rolls today and they were fluffy. I think the vital wheat gluten really helped, but they were kind of dry. Did I add too much flour? I added 4 1/2 cups. It is possible that you added a smidge too much flour. If you live in a dry climate like I do (Utah), start with 4 cups (total flour, not in addition to the original 2 cups used in sponging) and let the machine knead it a little bit longer (2-5 min). Your dough should feel soft, tacky, not sticky, and be elastic. You are only a small, short step from the perfect rolls! Take notes every time you make these: was it raining? (you may need 1/4 c. more flour on those days) or was it sunny and dry (use less flour). Good luck Dana! I went to culinary school but am totally new to the bread making world. I wanted to make these and add some jalapeno and bell peppers or maybe some garlic and onion. Would using fresh vegetables give this recipe a different texture than desired? Welcome to my blog! I have only used dry herbs and onion in this recipe ~ I would suggest making this recipe without the addition of veggies, so you can get the taste and texture of this roll. This is a buttery, slightly sweet roll, that is light and tender. I just happened upon your wonderful site while researching the logistics of making rolls for a large (80 people) club buffet party. I have already made the dough for a refrigerator rise rosemary savory roll (5 batches) and I am also in the process of making plain rolls. Obviously, with the host's ovens being occupied with the dinner entrees, I cannot bake my rolls at the party. Will the brown and serve method work for any dinner roll recipe? How far in advance can I bake rolls before a party? What is the best storage method to maintain their freshness? Thanks for any help that you can provide. Thank you for stopping by! The best day to bake the rolls is the day of the event. Since you say that the host's ovens will be occupied, bake them the day before, letting them cool completely prior to putting them in food safe plastic bags. This is what I do when I have baking orders for Thanksgiving. If baking the rolls the day before is not a viable option, your next best bet is to do what bakeries do: Parbake the rolls, which is the brown-n-serve method shown above. The cooled rolls will stay fresh in the refrigerator up to one week. Bake the rolls the day of the event or the day before. The brown-n-serve method should work for any dinner roll/cinnamon roll recipe. If you need to make the rolls far in advance (longer than 2 weeks), your best option is to fully bake the rolls and thaw them out the day of the event for full freshness. The other option is to freeze the shaped rolls before their rise (up to three months ~ any longer and the rolls won't rise), bag them and set them out to thaw and bake (like Rhodes rolls). I hope this information helps. Happy Baking! There is nothing better than warm bread or rolls right out of the oven! I lost my good go-to roll recipe a couple of years ago and I have been trying to find the right one ever since. I can't wait to try your recipe! So glad to have found your site!! Made two batches of these tonight. Put onion powder, garlic powder and dried cilantro in with the milk. When it came time to shape the rolls, I rolled them flat and stuffed half with diced ham and mozzarella and the other half with pepperoni and mozzarella . Let rise and baked as directed. Cooled on a rack and then stuck them in the freezer, ready to pop in lunch boxes. INCREDIBLE!!!!! Thank you so much! My hot pockets beat THEIR hot pockets six ways to Sunday. Yay! You're kids are SO lucky! 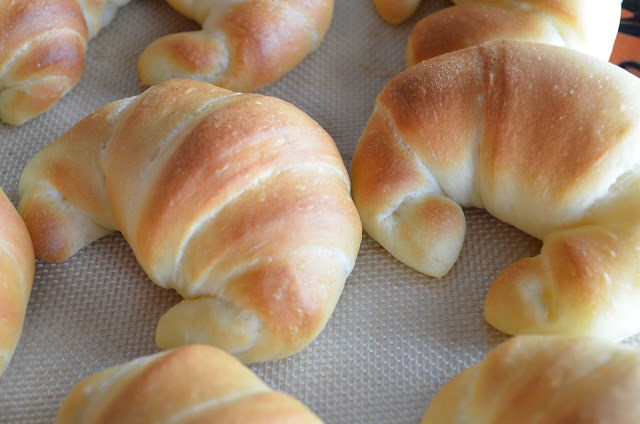 Thanks for another recipe for this versatile roll recipe ~ you rock!